Is Your Car Number Plate Legal? British drivers are unaware of whether their car number plate is legal or not, a new survey has revealed. A staggering 98 per cent of respondents to a Halfords survey were unable to identify number plates which were roadworthy and met the requirements of the Driver and Vehicle Standards Agency (DVSA). 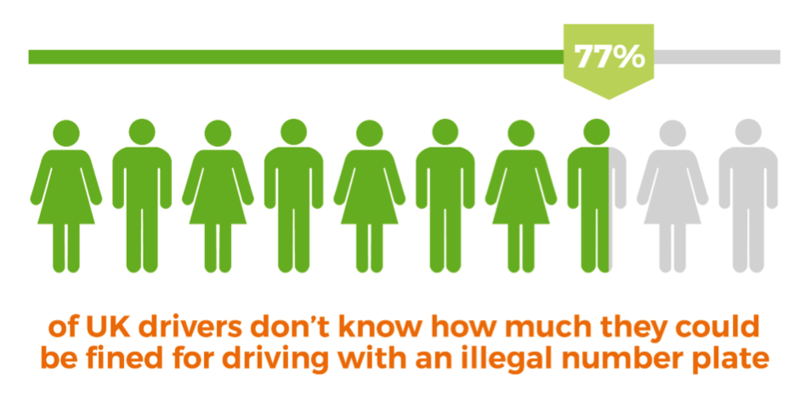 Worryingly, 77 per cent of those polled were also unaware of the penalties for having an illegal number plate on a car. Five per cent believed that it was okay to have a football club logo on your plate, whilst 25 per cent did not realise that there was only one standard Government approved font to be used on a number plate. Halford’s poll of more than 2,000 drivers found that young drivers are the age group who most often purchase illegal plates, with those under 25 six times more likely than drivers over forty-five to buy illegal plates. The incidence of illegal number plates has risen by 18 per cent according to data provided by the UK police, with areas such as Warwickshire (179%), Dorset (161%) and Gwent (96%) showing dramatic rises. A Halford’s spokesman said: “Number plates can only be purchased legally from DVLA certified garages or manufacturers, which can be easily located with the DVLA's helpful online tool. Doing otherwise can land you in seriously hot water. “Police are able to impose penalties of up to £1,000 for number plate related offences, so it's crucial to make sure your plates are roadworthy.